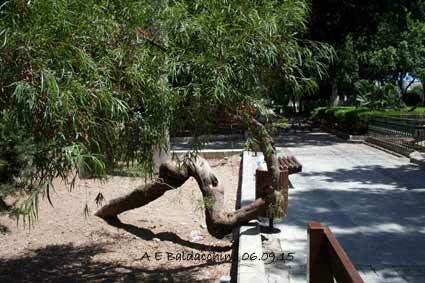 The unprofessional, dilettantish way of pruning trees in Malta is no secret. 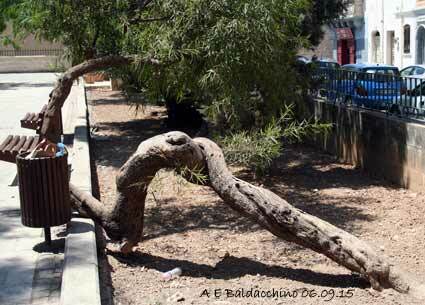 Apart from the many photos and comments in the mass media, the ‘art’ and ‘national wonder’ of this tree pruning is evident for one and all to see along the streets of Malta. And so are the impacts of its unprofessionalism. The conclusion without much thought seems to be that such pruning is done in the shortest time possible to fill the truck with the chopped off branches and disappear. No professional direction from those who are supposed to be professionally responsible for such works, unless of course this is the only professional way they know of. No vision for any aesthetic aspect, or for any ecological or social concern, or for the tree protection regulations (which under the previous responsible Minister have been amended to accommodate such ‘pruning’), which adorn the legal bookshelves of Malta, one of the 27th EU member states. 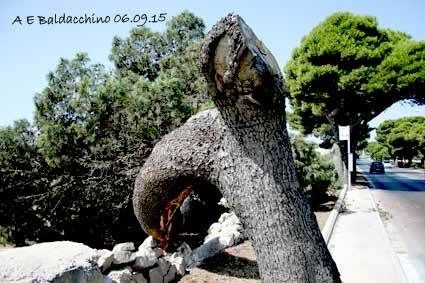 One of the ‘natural wonders’ of tree pruning in Malta. As screwed as the official vision of the tree pruning, appreciation, protection and management. The expenses for such a ‘national wonder’ has been paid from the €8 million public funds provided annually by Government. A different angle, for those who are a bit sceptic about such a ‘national wonder’. Since the management of Maltese street trees was taken out of the hands of the Department of Agriculture, it seems that ‘landscapers’ have grown faster than trees. If one can wield a chainsaw, start it and cut the widest trunk in the shortest time possible, than one is qualified as a ‘landscaper’. No qualifications needed, no licence needed, no monitoring needed, no questions asked, just wield the chainsaw and cut, cut, cut. One is also politically blessed, for such a work of art. Such is the pitiful state of ‘landscaping’ and ‘silviculture’ in Malta that one can easily compare it to an operation in the Intensive Therapy Unit, conducted by undertakers, instead of the medical profession. To make matters worse, such ‘landscaping’ is under the control of a Minster, responsible for landscaping, who endorses payment for such ‘national wonders’ of tree pruning out of €8 million yearly budget, the agreement on which is kept under lock and key. He is also aided by some of the Local Councils who also pay for such ‘national wonders’ out of public funds. And Government is happy with this too. 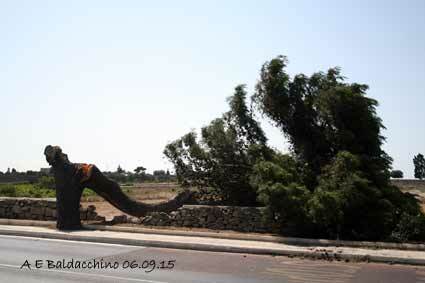 The result of such ‘national wonder’ of pruning in Malta. With the added high temperatures, the Aleppo pine, could not but break in two being so unbalanced. But this is the best professionalism Malta can offer in tree pruning. Another look at such work of art of local tree pruning. Incidentally another similar old tree further down the road was recently accidentally broken in twof by heavy machinery during works along the road. 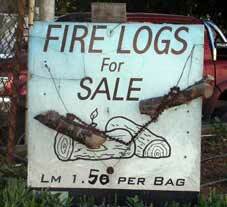 But the chainsaw was quick on the scene before any ‘fundamentalist’ could snap a photo or two. Minister Mizzi, responsible for road works and landscaping is accumulating quite a number of feathers in his cap! But one must give credit where credit is due. We have been told that the present political vision is to make Malta the best in the EU. Without any doubt, in the field of the destruction of biodiversity, Malta is the best in the EU! And to think that the EU Commissioner for the Environment is Maltese… what else can one wish for? Can the Minister responsible for ‘landscaping’ intervene to prevent such bull… paid out of public funds? ritratt mehud fit-8 ta’ Diċembru 2007. The Blueprint For Mepa’s Reform identifies four pillars to achieve such an aim. This was awaited by many who yearn for the real, honest and professional protection of the Maltese environment. How far does this blueprint succeed in ensuring such a vision? 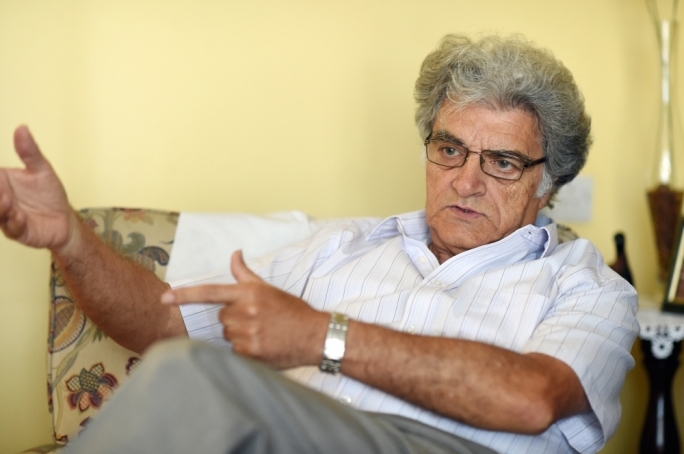 A number of functions were regarded as not being core to Mepa’s mandate and, as such, they were assigned to the responsibilities of other government entities. Yet, the most important functions that should have been assigned outside Mepa is environment protection. Perusal of the reform document leads to the conclusion that Mepa is regarded as just dealing with development and the issuing of development permits. The environment, on the other hand, is just an appendix to give its views, when asked, or when convenient. 1. The second sentence on the first page states that Mepa, as it is known today, resulted from the former Planning Authority being given the role of competent authority for environmental protection under the Environment Protection Act (EPA) in 2001. This is a totally incorrect statement because Mepa is formed by the former Planning Authority and the former Environment Protection Department. These are two different directorates. Whether this statement is a lapsus or whether the cat has been accidentally let out of the bag only the drafters of the report can say. But it vindicates those who say that the PA and the EPD never merged but the latter was taken over by the former. And when such a report is drawn on this assumption, than the whole reform is derailed. 2. In outlining the duties of the EPD, the report adds: This directorate formulates strategies, regulations and guidelines, monitors their adherence and regulates activities that may negatively impact the environment through a licensing and permitting system. This is also not completely correct. These are but a mild fraction of the duties of the EPD. The international duties such as those arising from international conventions and those of the European Union are but a few others. Far from just an input to development planning. 3. The Prime Minister said he definitely does not agree that the environment becomes a separate authority because: If the environment and the planning authorities do not agree, who would be the Solomon to decide. Shall we bring in a third authority? And this is the very reason why the environment and the planning authority should be different and separate. Every time the environment and the planning directorates do not agree it is always the development function that has the upper hand. This is even highlighted in the Mepa auditor’s Baħrija report dated July 20, 2009, which clearly states that the DCC did not even consult the EPD, despite the fact that the two Directorates are within one authority, again vindicating my reasoning in my contribution to The Times of April 22, 2008. No Solomon was needed to solve this issue: the EPD was just bypassed. And I am sure this is not what the Prime Ministers means and wants, yet, it is what is often being done. 4. The Prime Minister also stated that there is no point in Mepa having a minerals section when this is a resource and this is now being transferred to the MRA. I am also sure that the Prime Minister fully agrees that biodiversity (species and their natural habitat) are a very important national resource. With the same reasoning, shouldn’t this also be under the responsibility of the MRA? 5. The Planning Authority never had any international experience or responsibilities especially in environmental matters. After eight years of being exposed to such international responsibilities through the Environment Protection Directorate, the Planning Directorate is still very sceptical and still has not grasped the onus of such responsibilities. The authors of the Mepa reform report seem to be more familiar with planning and development matters than with environmental responsibilities. The proposed amalgamation of the Environment Protection Act with the Development Planning Act would mean laying environmental matters, with all the international and EU responsibilities, at the feet of development planning. Such a concern has already been expressed by the EU in one of its reports regarding the unhappy situation of the Environment Protection Directorate within Mepa. This proposal would be very costly, from a human resource, financial and political viewpoint. 6. The aura that surrounds the Mepa reform is mainly based on the economic aspect, leaving the social and ecological aspects aside and it is easy to see that the reform is only directed towards the old Planning Authority – development. The Cinderella at Mepa is fading into history books. Such a scenario would completely eliminate any basis for sustainability. I am sure and I honestly believe that the Prime Minister will take these points into consideration.